9.1 Why use Electric Chainsaws? Finding a great electric chainsaw can be difficult. This post explores 6 of the top models on the market to date. We found the DEWALT DCCS620P1 to be our top rated electric chainsaw. To find out why keep reading! Finding a great electric chainsaw can be quite a task. You need to make a variety of considerations. The first of which tends to be whether you opt for a corded or cordless model. In this section of the post we review 6 excellent options consisting of both corded and cordless electric chainsaws. Here’s a list of what we found to be the 6 best electric chainsaws which you’ll be sure to love. The first electric chainsaw on our review list is this Dewalt Guaranteed Tough chainsaw. This saw is one of the best in its class providing a low kick back and a 12 inch Oregon Bar and chain. This tough saw is ideal for outdoor cutting applications and boasts a high-efficiency brushless motor that maximizes the saw motor and life. The built-in auto oiling system to keep the saw chain and guide bar automatically lubricated. The Dewalt comes equipped with a tool-free chain tensioning and bar tightening knob. This saw is easy to use and easy to handle weighing in at just under nine pounds which provides added user control and comfort. An added bonus of this Dewalt tough tool is that the included 20-volt lithium-ion battery is interchangeable and powers over 180 Dewalt compatible tools. This Greenworks chainsaw is feature packed and effortlessly handles tough outdoor cutting projects.This saw features a brushless motor that promises to deliver 30 percent more torque for improved cutting performance. The brushless motor design provides for 70 percent less vibration for added comfort during use. The Greenworks features a technologically advanced electric start, automatic chain tensioning and an onboard automatic oiling system that gives similar saws in its class some very heavy competition. The electric chain brake is another advanced technology feature that makes this saw ideal for use for your outdoor cutting projects. Boasting an impressive and power packed interchangeable lithium-ion battery while providing up to 100 cuts on 4 x 4 lumber, this Greenworks chainsaw is sure to easily outperform comparable chainsaws in it’s class. The Black and Decker 20 Volt Max chainsaw is a member of the famed Black and Decker family of power tools that are guaranteed to get the job done. This compact chainsaw features a 10-inch premium Oregon low kickback bar and chain for ease of use and a tool-free blade system for quick adjustments on the go. The Black and Decker chainsaw also features an onboard oiling system for easy bar and chain lubrication. The wrap around bale handle makes your chainsaw cutting project a breeze while providing added comfort. This chainsaw also features an interchangeable lithium-ion battery on board that is compatible with Black and Decker’s full spectrum of power tools and lawn and garden tools. The Oregon chainsaw is a power-packed corded chainsaw that is the only corded chainsaw in its class to feature the exclusive PowerSharp self-sharpening chain system. The PowerSharp system automatically sharpens the chainsaw blades during use for an extended life. This low maintenance chainsaw stands out from the crowd with its brushless motor for improved torque and cutting ability. This chainsaw is an outdoor users delight proving itself to be a definite contender by providing an instant start feature with low noise and silence between cuts. The gorgeous ergonomic design is lightweight and balanced providing for low vibration and comfort during use. The over-mold comfort handle only adds to the maneuverability of this self-sharpening corded chainsaw. The high-powered Oregon saw comes complete with a tool-less chain tensioning system and reduced kickback bar and chain for seamless operation. The Worx chainsaw features a 5 amp motor that is designed to deliver superior cutting performance compared to similar chainsaws in its class. The Worx features a patented auto-tension chain tensioning system that prevents over-tightening and automatically adjusts to the right tension for your outdoor cutting projects. Another great feature of this Worx chainsaw is the automatic lubrication and built-in oil reservoir with included window level indicator. This chainsaw boasts a 200 ml oil tank capacity and comes fully assembled out of the box so that you can get to work on your tough cutting projects immediately. This chainsaw has an 18-inch cutting blade designed for cutting tough outdoor projects to provide stability so that you never miss a beat in the middle of your outdoor projects. 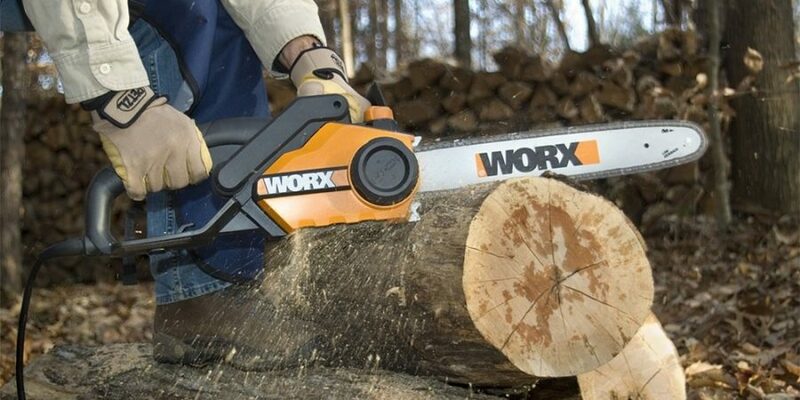 The Worx chainsaw features a 14.5 amp motor that promises to deliver the same cutting performance as a gas powered chainsaw and is specially designed for homeowners, farmers, and ranchers. This Worx family chainsaw comes equipped with the patented auto-tensioning chain system that prevents over-tightening during use. Onboard features of this Worx model include low kickback bar and a built-in chain brake for added safety during use for your outdoor cutting projects. The Worx also features automatic oil lubrication and a built-in oil reservoir with an easy to read window level indicator. One of the best features of this Worx model is the extended manufacturer warranty which guarantees your Worx chainsaw for 3 years. Electric chainsaws are the least expensive chainsaws available for homeowners and everyday users to buy in order to tackle your tough outdoor cutting projects. When your lawn, garden, and outdoor do-it-yourself projects grow to be more than you can handle, then its time to consider purchasing an electric chainsaw to get the job done. Electric chainsaws can be used to tackle tough outdoor projects including removal of unwanted tree branches, heavy-duty pruning, and landscaping. Electric chainsaws provide similar power to gas powered chainsaws without the addition of the annoying fumes that gas chainsaws are bound to deliver. Another benefit of using electric chainsaws is the variety of choices that can be tailored to your specific project needs. For smaller cutting projects a small compact chainsaw featuring a low amperage may be just the thing that you need. For more cutting power and adjustability choose an electric chainsaw that provides a higher amperage. Choosing the best electric chainsaw for your needs is largely dependent on the amount of outdoor cutting that you intend to complete. If you have a large-heavy duty outdoor project that needs tackling this is definitely going to place you in the category of choosing an electric chainsaw that provides higher amperage and extended bar length. Let’s look at some important features and factors to consider before making your chainsaw purchase. The length of your electric chainsaws cutting bar is a key indicator of how much your chainsaw can handle. Chainsaws that are equipped with longer cutting bars are designed to take on larger diameter wood in a single pass. The average length required for tackling household lawn and garden projects range from about 6 inches to 20 inches. When your getting ready to purchase your chainsaw remember that the longer the cutting bar, the larger the saw itself will be so this may lead into other factors to consider like the weight of the saw. While it may seem ideal to automatically choose a chainsaw that has a longer bar in order to finish your outdoor projects faster, as stated previously a longer bar adds the dimension of weight and ease of maneuverability into the equation. A larger saw may realistically get the job done faster, but at what cost?Choose a saw that you can realistically handle for an extended period of time if your project requires extended use. Extended bar length equates to heavier saw weight and more vibration. When deciding between a larger and smaller saw, ask yourself how much saw that you can realistically and safely handle. Reduces the amount of vibration that your chainsaw has while in use. This is an important feature to consider for heavy duty or larger outdoor cutting projects. Reduces strain and range of motion injuries by providing a spring-loaded assistance mechanism or automatic electric start option. Reduce the amount of kickback that electric chainsaws deliver during outdoor cutting. This feature operates by preventing the saw from being unexpectedly forced back or up during use. Allows for easy adjustment of cutting chain tensioning during use without having to completely stop during your outdoor work sessions. A built-in automatic safety features that cause your electric chainsaw to completely stop operations upon encountering unexpected impacts or abrupt jerky movements during use. Whether you are new to the use of electric chainsaws knowing how to safely operate and use your chainsaw is critically important to prevent undesirable results such as injury or extended project time. Another way to prevent injury is to make sure that you are fully equipped and suited up with the proper safety protections in place before beginning any outdoor cutting projects to reduce potential injury. Leg Protection – Wear chaps or cut resistant pants to prevent accidental cuts and reduce the chance of injury should an accidental slip of the saw occur. Head Protection – Wear a hard hat when working on cutting projects especially those situated above your head to prevent injury from falling branches and other flying debris. Hand Protection – Wear gloves with enhanced gripping features and cut resistant gloves in order to ensure a more steady grip on your saw while cutting and to reduce the chance of injury should a mishap occur. Eye Protection – Wear safety goggles with side shields to prevent flying debris from entering your eyes on each and every outdoor project that you undertake, no matter how big or small. Foot Protection – Wear boots or shoes with steel toes and non-skid soles to prevent cutting through footwear or slipping on unstable landscapes and surfaces. Hearing Protection – Wear ear protecting ear muffs or ear plugs to prevent damage to hearing or hearing loss from extended exposure to the loud noise that an electric chainsaw can create during use. For more information on chainsaw safety check out this useful guide from Stihl. Environmental Protection ConsiderationsMany states now have laws and regulations in place to assure the safety of our environment related to using power tools and landscaping equipment and chemicals. Electric chainsaws fall into the category based on the types of chemicals required to use and power your electric chainsaw. Be sure to check your local or municipal rules and regulations prior to embarking on your outdoor cutting projects to ensure that you are not in violation or in subject to any penalties under regulations like California’s Proposition 65. How do I know what size cutting bar to choose for my outdoor cutting projects? Consider the size of your project including the diameter of trees and other materials to be cut. Understand that larger diameter require larger cutting bar lengths which can increase the overall weight of your chainsaw. How do I know if I am in compliance with local regulations like California’s Proposition 65? Check with your local governing authority by phone or browse your local regulatory agency website to verify what the rules are for your local area. What is the main benefit of using an electric powered chainsaw vs. a gas powered chainsaw? The main benefit of choosing an electric chainsaw vs. a gas powered chainsaw is a reduction of fumes and gases that may adversely affect the environment along with affordability. When preparing to choose the best electric chainsaw for your outdoor cutting needs, be sure to check with your local governing authority to assure that you are in compliance with all local laws. Furthermore, Make sure that you get to know the features of your chainsaw and what you need based on the size and scope of your project. Finally, wear all recommended safety equipment 100% of the time when operating your new chainsaw. If you’re looking for a chainsaw specifically for cutting firewood, check this post out.